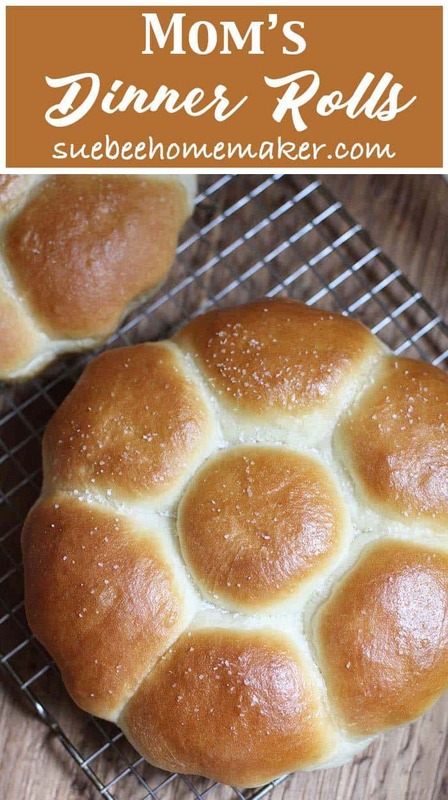 Mom’s Dinner Rolls should definitely be on your holiday table this year. Unbelievably soft and melt-in-your-mouth goodness, perfect for a small sandwich or just an accompaniment to the main course. Only six ingredients are in these rolls, plus a pat of butter and a sprinkling of kosher salt to give them that beautiful shine! My mom made her bread fresh the morning of our gatherings. She would get up at the crack of dawn to get her dough started, and by the time we got out of bed, she was pulling bread out of the oven and probably putting more in. Waking up to the smell of fresh bread is a pretty amazing memory. Mom’s whole world was taking care of her family. She wanted to make sure we all had our favorite foods when we visited, after leaving home. And fresh bread and rolls were at the top of all of our lists. I can see her now…bustling around the kitchen, punching down bread, brushing butter on whatever she just took out of the oven, adding flour to her grocery list. The kitchen was our gathering place whenever we were home. This dinner roll recipe is from Norma Jean’s Kitchen. It is actually HALF of her recipe as I’m pretty sure most people don’t make than many dinner rolls at once. Mom would often times make the entire recipe and make some cinnamon rolls, some dinner rolls, and maybe a loaf of sweet bread. This version makes approximately 20 rolls, give or take a few. You can put the rolls in any type of baking pans. If you get to the end and have just a little dough left, make a personalized bun (or two) in a ramekin. When you add the warm water to the yeast, sugar, and powdered milk – be careful to use WARM water, not hot. If the water is too hot, the yeast will disappear and you can’t make bread without yeast. Also, do not use cool water because it won’t activate the yeast. Don’t add all the flour at once because every baking day is different. Some days you will need a bit more flour and some days, you will need less. The dough should be slightly sticky when ready. Over time, you will learn exactly how much flour is needed to make the ultimate dinner rolls. When the dough is ready, you take a small amount and form it into a dinner roll. See the third picture below. I always use a small cutting board, rub some canola oil on it, and then use it to form the rolls. 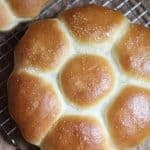 This recipe makes about three pans of rolls, or about 21 dinner rolls (see fourth picture below). You can make them in any size of pan you like, but I personally like the disposable ones. Make sure you put the smooth side of the rolls up and cover with a clean towel to let them raise again. Mom’s Dinner Rolls only take about 18 – 20 minutes to bake. You will know when they are done when they turn nice and golden brown on top and are just slightly brown on the bottom. 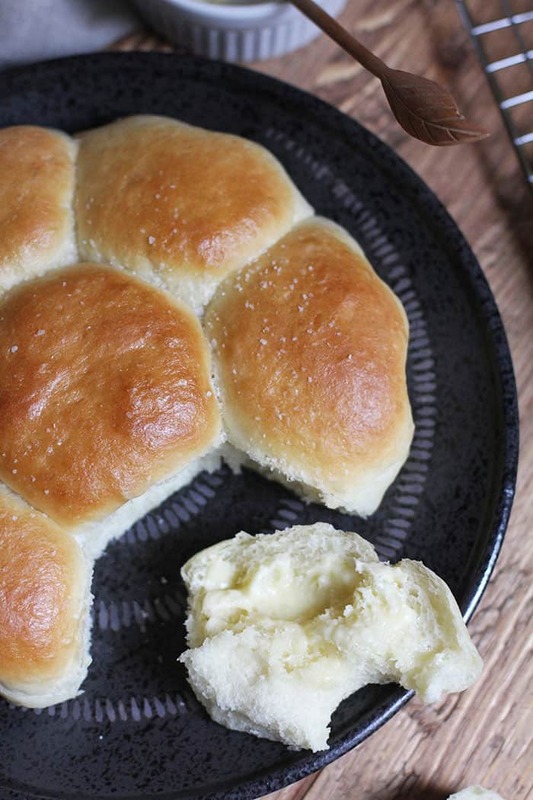 To get the beautiful shine on top, brush some butter on the top of the dinner rolls AFTER baking. Then sprinkle with a pinch of kosher salt. to make her bread, rolls, and even her cookies and cakes. I have one in my kitchen too, and it’s a lifesaver when it comes to baking. It’s LARGE so I can easily double all the recipes I have on here. The other huge plus is that it has a lid, so flour doesn’t fly all over the kitchen or ME! 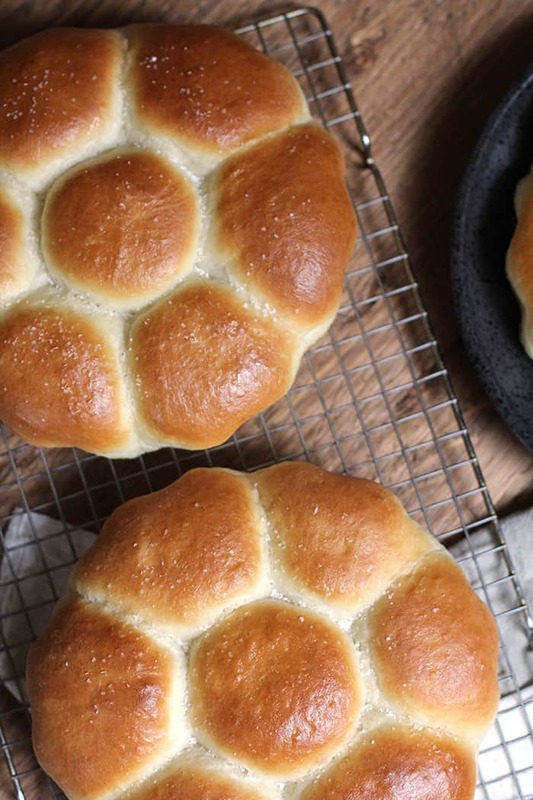 Unbelievably soft and melt-in-your-mouth goodness, these dinner rolls are perfect for a small sandwich or just an accompaniment to the main course. In large standing mixer, combine the yeast, powdered milk, sugar, and warm water. Be careful to use warm water, not hot. Mix with a rubber scraper and let sit for about 15 minutes to get the yeast working. Add the salt and canola oil and mix again. Gradually add 5-6 cups of flour until you get just the right consistency. The dough will pull away from the sides of the mixer when it is close to being ready. You want the dough to be soft but not too sticky. Grease a large bowl with canola oil and add the dough. Punch the dough down into a nice smooth ball. Place smooth side up and cover with a clean kitchen towel. Place in a warm corner of your kitchen. Let the dough rise until doubled in size. This could take anywhere from 30 minutes up to more than an hour. Punch down and smooth it out, and let it rise again. 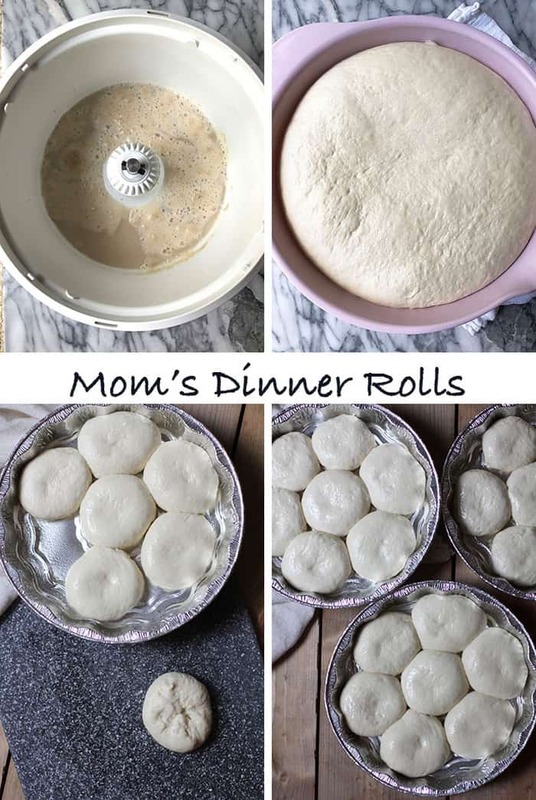 Take the dough and cut off small sections (about a third of a cup in size) and form into rolls (using a greased baking mat or cutting board). Place rolls into greased pans, making sure the rolls barely touch one another. Cover rolls with clean town and let rise again, about 30 minutes. Be careful to not let the dough rise too much or air pockets will form on the top. Bake on 350 degrees for approximately 18 - 20 minutes, depending on the size of rolls and the type of pan you use. You will know they are done when they are golden brown on top and are just starting to brown on the bottom. Remove rolls from pan, brush tops with butter, and sprinkle with kosher salt. Let rolls cool on baking racks and store in airtight bags. Before serving, warm the dinner rolls up slightly so they are nice and soft. The yeast will bubble up when it’s activated. When the dough is ready, you take a small amount and form it into a dinner roll. I always use a small cutting board, rub some canola oil on it, and then use it to form the rolls. 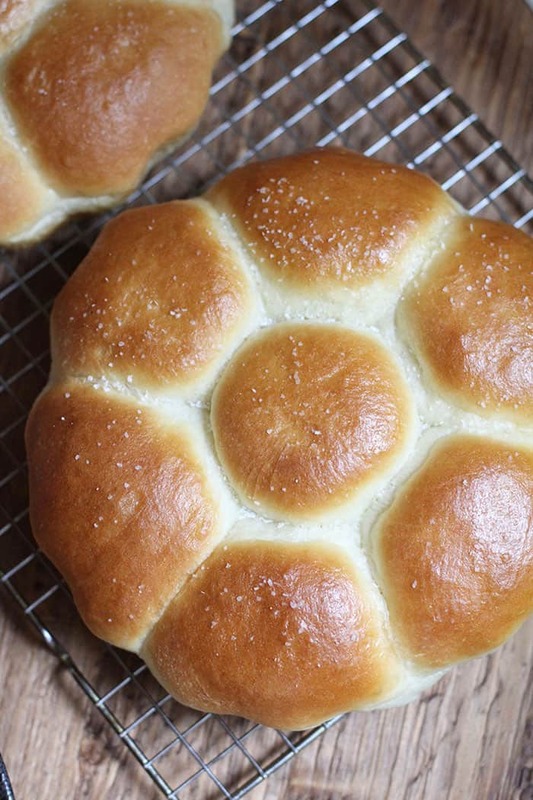 This recipe makes about three pans of rolls, or about 21 dinner rolls. You can make them in any size of pan you like, but I personally like the disposable ones. Make sure you put the smooth side of the rolls up and cover with a clean towel to let them raise again. Mom's Dinner Rolls only take about 18 - 20 minutes to bake. You will know when they are done when they turn nice and golden brown on top and are just slightly brown on the bottom. Mom's Dinner Rolls freeze well in freezer bags up to three months. Take them out of the freezer a couple of hours before your meal. Warm them slightly in microwave right before serving.